Where's that vibranium shield when Donald Trump needs it? Chris Evans unleashed his fury on the POTUS for his bad spelling. Captain America isn't noted for his wit and repartee - the choice one-liners in the Marvel Cinematic Universe are reserved for Tony Stark/Iron Man - but off screen, on Twitter, Cap is repeatedly proving he can burn with the best of them. And his insults are aimed at one person. Not just any person, and certainly no Marvel supervillain - it's not H.Y.D.R.A, not Ultron, not even Thanos. The man who regularly provokes actor Chris Evans into channelling his inner Tony Stark is US President Donald Trump, who just infuriated Cap by failing to spell 'counsel' correctly in a tweet. Now, spelling is not one of Mr Trump's talents - he has been known to unintentionally add to the English dictionary by tweeting gibberish such as 'covfefe' (we think he meant coverage but hey, don't quote us on that). In comparison, 'councel' instead of 'counsel' is relatively tame. But Chris Evans has had quite enough of 'Biff,' as he disdainfully calls POTUS on Twitter. In a tweet posted about 17 hours ago, the Avengers star unleashed his fury on the POTUS for his bad spelling. "Disgraced and discredited Bob Mueller and his whole group of Angry Democrat Thugs spent over 30 hours with the White House Councel..." wrote Mr Trump, referring to White House Counsel Don McGahn. He was rewarded with a biting tweet from Captain America, where he blasted not just Donald Trump's failure to spell but also his (lack of) reading habits. "It's 'counsel', Biff. The word is 'counsel'" he wrote in his hilarious takedown. It's 'counsel', Biff. The word is 'counsel'. 'Covfefe' might not even have been Donald Trump's worst spelling sin. Let's not forget that he once misspelled his wife Melania's name as "Melanie." Unluckily for him, Chris Evans - and several other celebrities - live for moments such as these. Just one month ago, the Avengers star referred to Mr Trump as a "moron, puppet and coward" for siding with Russian President Vladimir Putin over US agencies. This moron, puppet, coward sided with Putin over our own intelligence agencies! On a world stage!! BASED ON NOTHING MORE THAN PUTIN'S WORD! Why?? Can ANYONE answer that?? What the hell is happening. Politics aside, this is 100% un-American. Where are you @GOP???? Before that, the longtime critic of Donald Trump had called him a "meatball." And in May, he had likened the US President to "a 6-year-old wearing a Burger King crown." And in January he had referred to him as a "Human Centipede"
I'm beginning to think the movie Human Centipede was more prescient than it was given credit for in foreshadowing the Putin, Trump, Stephen Miller garbage train. 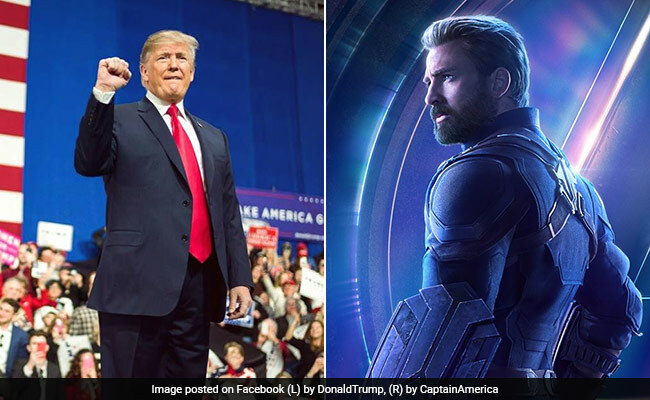 (chris evans VS donald trump)@batuukcbs as infinty war burda. Which has been your favourite tweet so far? Let us know using the comments section below.